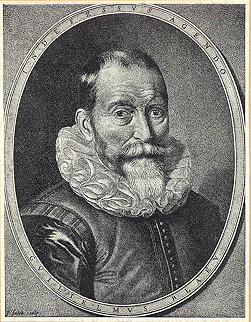 Willem Janszoon Blaeu (1571-1638) also rendered Willem Jansz Blaeu, was a Dutch cartographer and atlas maker, born in Alkmaar. As the son of a well-to-do herring salesman, he was predestined to succeed his father in the trade, but his interests lay more in Mathematics and Astronomy. Between 1594 and 1596 as a student of the Danish astronomer Tycho Brahe he qualified as an instrument and globe maker. Once he returned to the Netherlands he made country maps and world globes, and as he possessed his own printing works was able to regularly produce country maps in an atlas format, some of which appeared in the Atlas Novus published in 1635. In 1633 he was appointed map-maker of the Dutch East India Company. He was also an editor and published the works of Willebrord Snell, Metius, Vossius and the historian and poet Pieter Corneliszoon Hooft. He had two sons, Johannes and Cornelis (1610-1648), who continued their father's mapmaking and publishing business after his death in 1638. Prints of the family's works are still sold today. Original maps are rare collector items.